Just as in fashion, color trends in decorating are constantly changing to bring us brighter, better, more inviting rooms than ever before. Unlike in fashion though, there will always be kitchen color favorites that are traditional, tried and tested. The most popular kitchen paint colors of the moment complement stainless steel appliances, natural material countertops, and gloss finish cabinet doors, as well as the more traditional wood cabinets. In short, they have changed with the way the materials and appliances we use in our kitchens have changed. Yellow - rich, warm, and creamy shades as opposed to pale and sunny tones. Purple - a hot color trend, especially the more rich berry hue. Red - more on the side of burgundy and deep red, than scarlet though. Cream - goes with almost anything and creates a warm feel. More beige and mushroom tones, as well as rich cream work well too. Duck Egg Blue - Warmer than ice blue, and less intense than mid/navy blue. But how can we use these colors in the kitchen, and how do we know which is the best match for us? Knowing the most popular kitchen paint colors is all very well, but it doesn't necessarily follow that all of these would be a perfect choice for you. As well as your personal taste, we also have to consider existing features, and if they will match with your preferred color. Light wood cabinets benefit from warm yellow, cream, and duck egg blue paint on the walls. 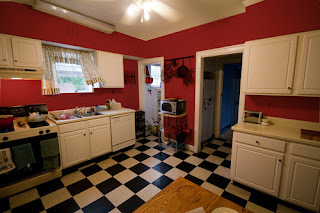 Dark colored cabinets love darker cream, and intense colors like red. Granite worktops in a kitchen are complemented by yellow walls, and rich cream, as are concrete countertops In small areas, rich red is also a winner. Wood countertops can handle most colors, but benefit from a lift of warm color. 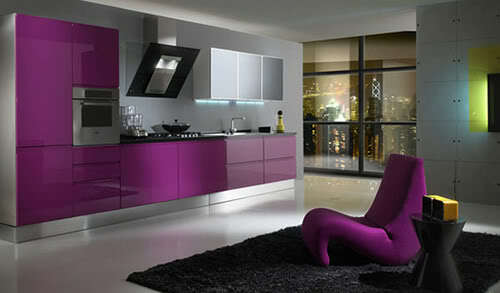 Current color trend cabinets such as purple and red, are complimented hugely by cream, or even yellow in small spaces. The opposite is also true - glossy finish cream cabinets with a red or purple paint on the walls are a winning combination. You should avoid bland colors on the wall such as magnolia, unless you add a paint effect over the top, to bring it to life. Crisp white, or small elements of charcoal and black are acceptable as accents, and work with any color scheme. Remember that the paint you use on your kitchen walls doesn't have to be restricted to just one color either. Just as a living room will often have a focal point to decorate around (like a fireplace), so too does the kitchen - usually the stove and extractor fan area. You can choose to decorate this section in a complimentary color to the main color of your walls. 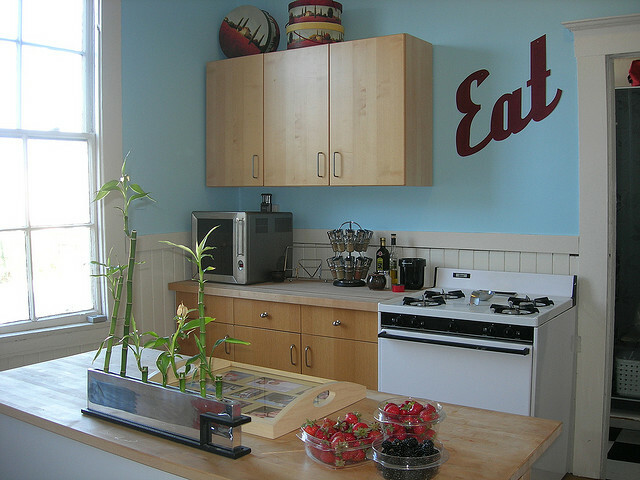 Using these tips and suggestions, decorating with popular kitchen paint colors will be easy as pie.